After the blockbuster success of films like Judwaa 2 and Baaghi 2, Sajid Nadiadwala and Fox Star Studios (Hindi) have once again joined hands for Dangal director’s, Nitesh Tiwari, next untitled film. While Sajid Nadiadwala and Fox Star Studios are known to deliver commercial extravaganzas, Tiwari’s last outing Dangal showcased an underdog story emerging from the heartland of India. After bringing to celluloid a story that struck chords universally, Tiwari has collaborated with Sajid Nadiadwala and Fox Star Studios for a riveting story about the today’s generation. 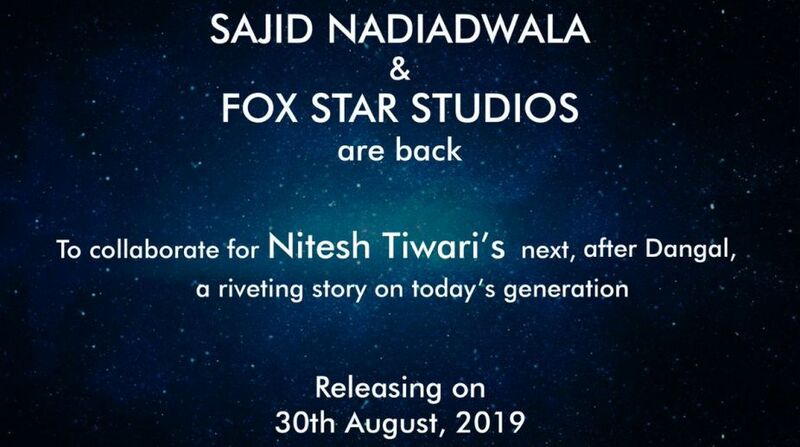 Director Nitesh Tiwari also announced on social media saying, “Looking forward to being a part of the #SajidNadiadwala and #FoxStarStudios family for my next, after Dangal. A story I am excited to tell. Releases on 30th August 2019. Cast to be announced soon, stay tuned! @NGEMovies @foxstarhindi”. The trio is all set to release their upcoming untitled film on 30th August 2019 and the cast of the film will be revealed in 2018.